Being in Seminary I tend to take things for granted. The beautiful liturgies, structured prayer time, community of men who all thirst for holiness, etc. Over time I think that it can become a sort of routine and we lose sight of what is really important and the focus of our prayer. This sense of “hypocrisy in prayer” can be looked at as being false piety, laziness in prayer, or just having no motivation to do anything spiritual or deepen our prayer life. So basically, I was a little worried about this experience, but I should have remembered not to judge a book by its’ cover. Lesson learned. (Hey, I’m human and I make mistakes) When I got over to campus we all had to wait outside the door, since the electronic pass for our ID’s wouldn’t let us enter the building. A quick call to Daniel and we were let in. 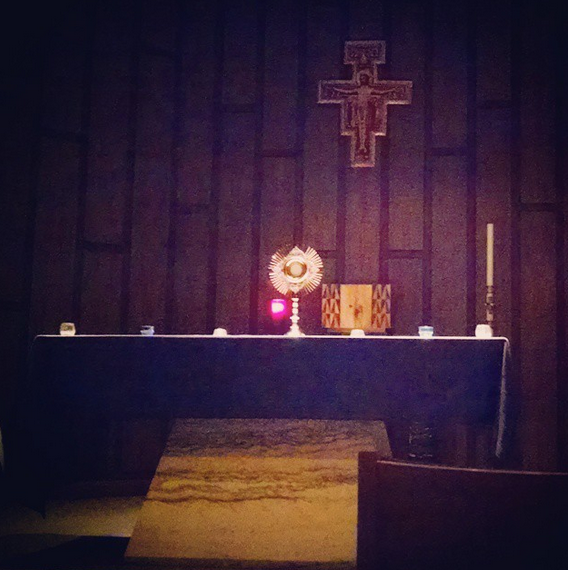 We headed to the chapel and after about 10 minutes of quiet prayer before the exposed Blessed Sacrament we began to pray Night Prayer. Let me first speak of the quietness and reverence which existed in that small chapel. I was talking with a priest friend the other day who remarked that it was odd that on the weekends we had to stay at the seminary for Mass. In his mind, we should be out at the parishes, giving witness to vocations and gaining valuable experience. There is something to be said of this. Being stuck in the seminary we can get caught in the wake and lose sight of that vocation to service, which is the priesthood. Countless priests have remarked to me that: “You do not have a vocation to seminary, but priesthood.” When we have moments of service to others and experiences of encountering others in intimate ways it helps to refocus on what we are in seminary for. The priest is first ordained a deacon, the ministry of service. As Christ served others, so we are called to serve. Kneeling and sitting in the chapel I was surrounded by quietness, and a wide range of postures. People kneeling without kneelers, making themselves as small as they could by lying prostrate, sitting in the pews, and a multitude of other movements. During adoration at the seminary we all kneel together, or sit. The routine-ness of our posture at times can make us forget what we are doing I think. Before we began to pray I sang the Ave Regina Caelorum one time through so that everyone sort of knew how it went, before we began to pray. Night Prayer at the seminary and really any prayer can seem rushed. Guys are so used to doing it and let’s face it it IS mandatory that we be there and do it, so it can be seen as something to just be gotten done with and over with. Fr. Joe commented the other day on how praying the Liturgy of the Hours is called the Work of the Church. We are called to make sacrifices when we pray it and to really work at it for the salvation of all of the people of God. Sitting in the chapel as we began to pray there was a slow, even pace, with ample times of pause and silence between stanzas and parts for reflection and meditation. There was time to sit in the presence of Christ and just be. I was asked to read the reading, which surprised me but I appreciated the offer and the sense of want to include me as I technically was/am a bit of an outsider to the community gathered. We then chanted the Ave Regina Caelorum and sang Tantum Ergo before one of the students reposed the Blessed Sacrament. Even singing the Tantum Ergo was slow and thoughtful. Then we shared a Sign of Peace with each other and went our separate ways. So in short, what am I thinking of? Prayer is a labor of love. As Men in formation we are called to fall in love with Christ and develop a deep and intimate relationship with him. Overtime, the way we pray in the seminary can seem routine, and we can get stuck in the rut of praying, but really not being all there. I am calling this: The hypocrisy of prayer. How do we remedy it? Get out of the seminary! Spend some time on a Saturday evening at a parish Mass in town. Meet some friends for prayer on campus throughout the day or go to Stations of the Cross at a parish nearby. BE Active. Don’t wait for your prayer life to improve. MAKE it improve. Offer 110% to God and he will repay you tenfold. Make your prayer your work. Make it a labor of love. Fall madly in love with Christ. Spend time with him. Change up your prayer habits. Whether it means kneeling or walking when praying the rosary or singing your office instead of reading it silently. Change it up every now and then to keep it fresh and new. Pray INTENTLY and WITH MEANING. One of the things I love about praying with some of my priest friends back home is that we pray the LOTH as if it were a conversation. (And it is. We join Christ in offering it up to the Father.) Put emotion and emphasis behind it. Don’t just be monotone. Focus on what you say and pray. Slow it down. Breath, relax, think about what you pray and take some time. Give to God your time and you will still get everything else in life done, usually easier than if you did it yourself. I am going to try to avoid falling into the hypocrisy of prayer while I continue throughout Seminary. I encourage you to encourage/challenge me, and to strive to grow as well. Prayer is a beautiful thing. Let’s make it matter more to us. Don’t fall into the rut, but if you do, climb out and try again. Our Lord doesn’t demand our love. He invites us to give it to him. Fall in love. Pray like you mean it. Strive for holiness as we continue to walk this Way of Beauty together. Notate Bene: Thanks so much to Fletcher, Connor, Billy, and everyone on campus who made tonight so special for me. Your sense of love and devotion to our Lord is so refreshing and has truly helped me to grow. Thank-you! ← Beauty from the Fathers :: What is Beauty of Body? How Can We Tell if Someone is Beautiful?